Serendipity is the art of stumbling across beauty or pleasure when you least expect it, and the Ida Bay Railway was, for us, pure serendipity. It was the last day of our trip to Tasmania and we had driven as far south as we could in our hire car - beyond Ida Bay the road was dirt and therefore forbidden to us. As we turned to retrace our steps back to Hobart we spotted the tiny train in its station and on a whim decided to take the ride. Luxury it was not. The train rattled and rolled - the driver later told me that they are legally required to have every second sleeper good on the curves and every fourth on the straights and hinted that they aim to fulfil their legal requirements and no more - the diesel engine roared and stank, but the scenery as we wound through interminable gum forests was beautiful. Half way along we stopped at a tiny cemetery where the first white settlers in the district are buried and the driver transformed into informative guide with a wicked sense of humour and a fund of stories, many of them tragic. At the far end there was a fifteen minute break so we could admire the derelict jetty and, if brave, use the primitive bush toilet. The round trip takes two hours and covers approximately eight miles. 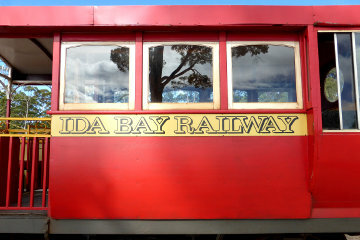 I can thoroughly recommend the Ida Bay Railway!